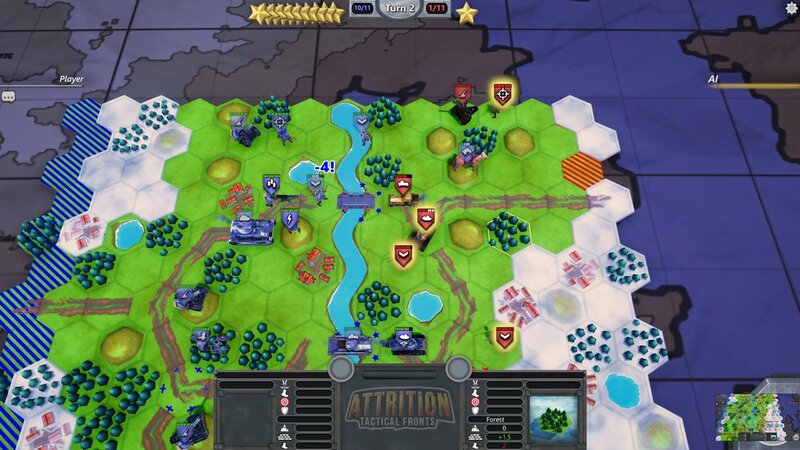 Attrition: Tactical Fronts is a quick play, turn-based strategy game for 1-2 players. Matches can take as little as 5 minutes while offering strategic variety and depth. Hex-based, turn-based gameplay, like a digital board game. 17 mission single-player campaign to learn unit and terrain types and combinations, overcome challenging scenarios and attain mechanical mastery. 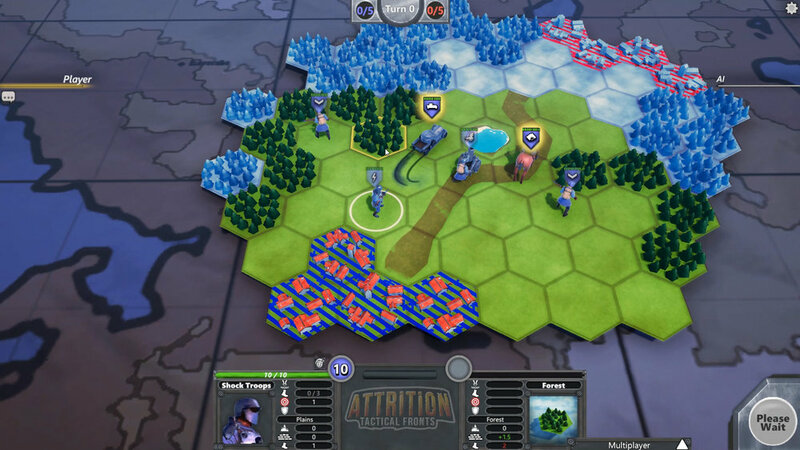 AI skirmishes on infinite randomly generated maps and developer or player-created custom maps. 1v1 online multiplayer (friend invites, stat tracking and player progression coming soon). In-game map editor to create your own single- and multi-player scenarios, with Steam Workshop support. 11 different units and 15 terrain types provide varying tactical engagements. Point-buy army requisition, pick your own preferred unit composition, or try to counter your opponent's picks. 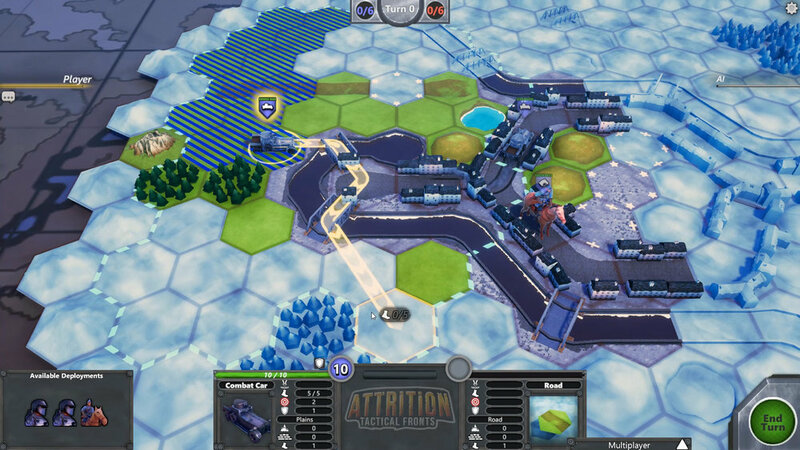 Attrition: Tactical Fronts is made by Cardboard Keep, a small indie team in Canberra, Australia. Attrition is our third major title, following up N64-inspired action/adventure platformer Warden: Melody of the Undergrowth, and casual puzzler Puzzle Puppers. Infantry are the basic troops forming the backbone of any fighting force. The Marksman excels at picking off targets beyond their counter attack distance. Once inside counter attack range, they become very vulnerable! + Longest range direct attack. - Extremely vulnerable to counter attack. While the Machine Gun can't move and attack in the same turn, it compensates by dealing both suppression and regular damage. + Deals bonus suppression when attacking. - Can't move and attack in same turn. Artillery has the longest range of any unit in the game - perfect for laying down suppression from afar. Just don't let it get flanked! + Longest range indirect attack. - Very vulnerable to direct attack. Fast and lightly armoured, the Combat Car is great for flanking, scouting, and attacking support units. The Heavy Tank's thick armour and large bore cannon make it a force to be reckoned with on the battlefield. Shock Troops fight with devastating determination and firepower. No matter how much damage they have taken, they still fight at full capacity. They specialise in close-quarters encounters. + Always attacks at full strength. - Still vulnerable to suppression. 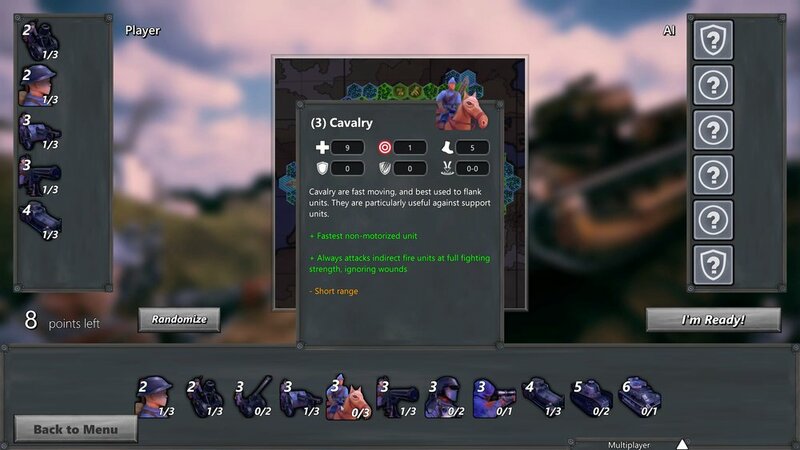 Cavalry are fast moving, and best used to flank units. They are particularly useful against support units. + Always attacks indirect fire units at full fighting strength, ignoring wounds. Cheaper and faster than Artillery, the Mortar supresses enemies from a decent distance. + Long range indirect attack. - Vulnerable to direct attack. 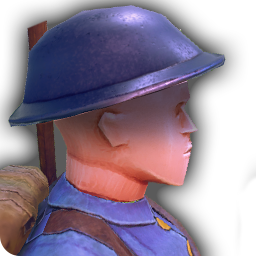 The long-range AT Gun has the best armour penetration on the battlefield. However, it is very slow and vulnerable to direct attack! - Weak against unarmoured units. Decent armour protects the Light Tank from small arms fire. Its small bore cannon blasts through other light armour. Copyright 2016-2018 Cardboard Keep PTY LTD. All Rights Reserved.